Resolute’s sustainability leadership has received an honorable mention by the DuPont Safety and Sustainability Awards, which recognize outstanding initiatives aimed at enhancing workplace safety, sustainability and operational effectiveness. Winners of the DuPont 2017 awards were announced on September 4, in Singapore. Highly coveted as the corporate benchmark in sustainability leadership, the international DuPont Awards celebrate the achievements of companies that have found effective, innovative ways of becoming greener, cleaner and leaner. In rewarding Resolute, the judges noted the following achievements: 73% reduction in GHG emissions since 2000; 74% of energy requirements sourced from renewable sources; 80% of fuel energy derived from biomass sources; 100% of managed forests third-party certified to internationally recognized standards; 100% on-site coal-free operations since 2014; and investments in innovative projects, such as the wood pellet plant in Thunder Bay (Ontario) and Toundra Greenhouse joint venture in Saint-Félicien (Quebec). The recently inaugurated world-class greenhouse complex, in which Resolute owns a 49% interest, will be deploying leading enzyme-enabled carbon-capture technology, which will reduce carbon emissions. 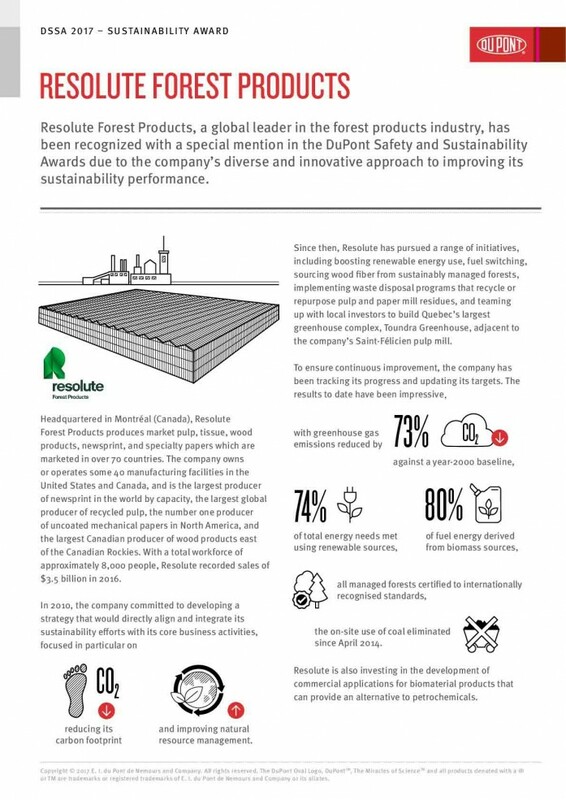 For more details on the 13th edition of the DuPont Safety and Sustainability Awards and Resolute’s successful carbon reduction efforts, read the press release here.